Two years ago, the Michigan Wildlife Habitat Foundation, the National Wildlife Federation, and the Michigan Department of Natural Resources launched a joint effort to improve outdoor sites for environmental education on school grounds throughout Michigan. The Nature Education Sites for Tomorrow (NEST) 2000 Program has since provided technical, financial, and contracting assistance to more than 100 schools to develop nature education sites. On October 12th, representatives of the participating schools and sponsors gathered at the Bengel Wildlife Center to celebrate the program's initial success and seek ways to further improve nature education in the new millennium. The program included three related workshops and an awards presentation ceremony, sponsored by Keep Michigan Beautiful, Inc. The following schools listed were all award winners. Click on the lists to view the summaries of schools, sponsors, and projects larger. 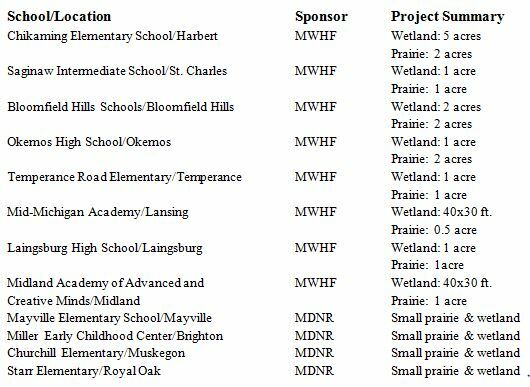 A large number of schools had sites that could support both prairies and wetlands. In addition to the prairie plantings, wetlands were established by excavation, and/or blocking drainage systems and installing water control devices. The wetlands were shallow, typically less than three feet deep. Some of the participating schools planted water lilies and shoreline plants such as pickerel weed, but most allowed the wetlands to re-vegetate naturally. Cadillac Public Schools had a unique opportunity to improve stream fish habitat as well as restore a small wetland and prairie. They developed this outdoor education area with help from the Michigan Wildlife Habitat Foundation at the edge of the city next to a complex of soccer, softball and baseball fields. The work was the first segment of the Clam River Greenway Project which has been planned for several years. Eighteen rock-based stream improvement structures were installed to deepen pools, create fish cover, and stop bank erosion in a half-mile stretch of the Clam River. Two acres of prairie wildflowers with smaller patches of prairie grass were planted next to the stream, and a one-acre wetland was restored with a water control structure. Cooperators included the Michigan Department of Environmental Quality, and several local agencies and civic groups. Even where space is limited, schools can establish small gardens with plants selected to attract songbirds along with butterflies, hummingbirds, and moths. Many NEST Program participants used small grants to plant a mix of conifers and deciduous trees and shrubs, vines, and flowers in odd corners or along sides of buildings. The students did most of the planting and the projects involved the aesthetics as well as wildlife values of the school grounds. Many NEST Program projects focused on establishing prairie wildflowers and grasses. Michigan once had over 100,000 acres of native prairie, but that natural resource has all but disappeared. Participating schools planted prairie wildflowers mixes and/or tall grass species including big bluestem, little bluestem, switchgrass, and indiangrass. Some of the schools in northern and western Michigan established meadows of five acres or more. The wildflower plantings are maintained by mowing in the fall. The prairie grasses are maintained by prescribed burning in early spring. Prairie management can be passive or intensive. Some of the schools have opted to involve students in regularly scheduled management and research. Included in this category are some sites with hummingbird/butterfly gardens and shrub/tree plantings. Many school districts have sites where wetlands can be restored by simply blocking drainage systems. The project sponsors provided technical assistance in both the design and construction. Some wetlands were constructed by excavation. Where space was limited, "wetland labs" with surface areas of about 40x30 feet were built by excavating a three foot deep hole, installing a plastic/rubber liner, and placing a foot of soil over the liner. Wetland plants were then added. This resulted in shallow ponds/wetlands that are easy for classes to use for both brief and extended sessions. A unique effort provided outdoor learning sites at parochial schools in the Diocese of Greater Grand Rapids. The National Wildlife Federation's Schoolyard Habitat Program, with financial assistance from the Wege Foundation, helped teachers and students create schoolyard habitats at 16 elementary, middle, and high schools. The Federation provided teacher and volunteer training, grants for habitat development, and habitat certification. Supporters of the individual projects included Frederik Meijer Gardens, Center for Environmental Study, Franciscan Life Process Center, Aquinas College, and Wild Birds Unlimited. The habitats ranged from urban butterfly and songbird gardens to large prairie and wetland restorations.